There is so much that I can say about this festival. The weekend was filled with unforgettable moments, wrapped in connections, and topped with crazy weather. It was such a wonderful feeling to be back on Mulberry Mountain again, especially in light of my history there, and even in spite of the muck. I hope to be able to make it out to Ozark again, sometime soon, and next time, perhaps, it'll be a little less muddy. This year's Wakarusa was quite the event. I must say, it was the most intense festival experience I've ever had, and I've been to my fair share. The extreme weather threw a wrench in things on several occasions, leaving me to spend more time waiting in the car than could be considered pleasant. 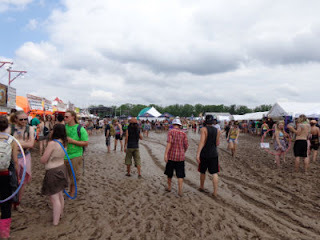 And when I wasn’t shielding myself from the rain and lightning, I was treading through ankle deep mud and muck that spread over the entire festival grounds. My crew affectionately (or not so) dubbed it the Waka Monster, as it could be seen eating shoes and even swallowing festival-goers whole. Over the course of the weekend, the Waka Monster grew in size and strength, thriving on the heavy rains and incessant foot traffic, until the sunshine of Saturday and Sunday caused it to shrivel up and retreat (but not surrender). Everyone moved in slow motion. 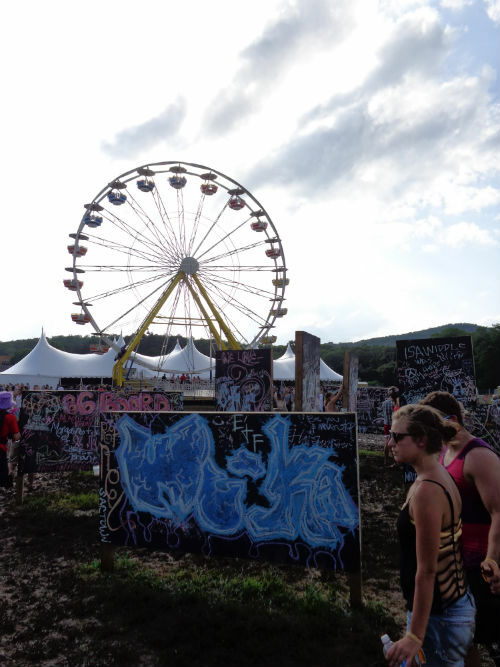 Getting to the Main Stage was a feat, and even the pathways in the campgrounds were consumed. Only the Satellite and Backwoods Stages remained relatively unscathed. I do believe the Waka Monster could have been defeated, or at least held at bay, with more proactive efforts. Gravel and hay were laid down in some areas, but certainly not in large enough quantities to make a serious impact. Some of the mud was also scooped out and carted away, but with people constantly walking on it, it just kept regenerating. I had to toss out both pairs of shoes I came with, and my feet stayed wet for most of the weekend (which could have been avoided by dropping $30 on rainboots being peddled around the campgrounds, but I’m such a miser, I just couldn’t bring myself to do it). 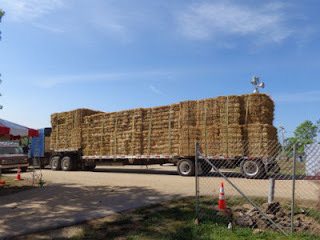 On Monday morning, a flatbed semi piled high with hay rolled in, making me wonder why it hadn’t shown up sooner. 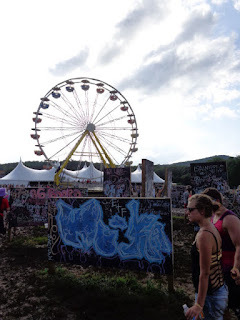 However, even in the face of all the “drawbacks” (I’d say they added character), the positivity, kindness, and willingness to tread on that are always a big part of Wakarusa — but seemed even more so that weekend — was truly inspiring. Helping hands were lent all around: pushing out stuck vehicles, rebuilding campsites, offering dry clothes and warm food, or even just a welcoming smile. In a situation where it would have been so easy to become hardened and cold, the Wakarusa community showed its strength in good-heartedness. Sure, some people got fed up and left, but only a small number compared to those who stayed and laughed through it all. Very few sour faces did I see, which is in itself a testament to the power of music to keep our spirits high when they might otherwise falter. And the performers reflected a respect for the hardiness of the crowd. Artists who attended only on the days of their shows expressed gratitude to attendees for sticking it out and coming to see them play. Those who stayed the entire weekend brought their A-game in attempts to make up for the plethora of cancelled shows. It’s not like they didn’t have to deal with the mud, either. Stephen Murray of Holy Ghost Tent Revival told me that the band arrived at the Backwoods Stage with 10 minutes until its set after getting stuck in the mud four different times. So Wakarusa 2013 was an adventure for us all. The weather tested our resolve and the mud tested our feet. Cancelled sets meant disappointment, but also created time for connecting and getting to know our neighbors. And the final days of sunshine brought back the party and the good times. So many memories were made that weekend that I won’t soon forget. My sincerest gratitude goes out to the festival organizers for keeping us all safe, and for getting the show going even when it seemed it might be time to call it quits. For as much as we went through as attendees, I’m sure their stress level was through the roof, trying to keep everything together without losing their sanity. So thank you, for all that you did. Next time, let’s just try to leave a little less trash on our Mulberry Mountain home.